FabianMH is at work again. 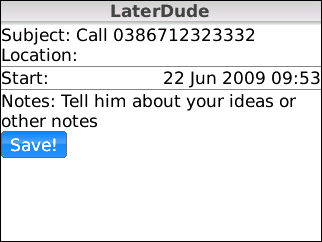 His last awesome application was Force Radio On and this time around he has rolled out "Later Dude", a great little utility application which allows you to set a reminder with notes into your calendar to call someone back just in case you forget, I personally have a bad habit of forgetting to call people back (yes, I have an ex wife) at times so this is perfect for me. Support for all devices is included with this one and be sure to check out the instructions for after installation, while simple the application will not work correctly unless followed.